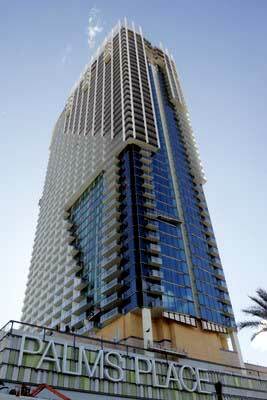 Deposits for the luxury residences equaled 20 percent of the purchase price of almost $1,000 a square foot. Condo floor plans ranged from 600 square feet to 1,200 square feet. The developer is optimistic for buyers to close escrow on their units. Several other condo hotels on the Las Vegas Strip include Cosmopolitan, Fontainebleau and MGM Mirage Project CityCenter. Amenities include 24 hour room service, beauty salon, lounge and restaurant operated by restaurateur Kerry Simon, business center, concierge service and a lobby bar. The hip units include 42 inch plasma televisions, designer accessories, rainfall showerheads, private balconies, fully equipped kitchens and jetted tubs. Palms Place real estate will feature the first hamman, or Turkish bath, in Las Vegas, Nevada in the 50,000 square foot pool and spa. For the ease of moving around the development, the SkyTube, enclosed and elevated moving walkway, joins the Palms casino and guests of Palms Place. Palms Place Las Vegas condo hotel expects certificate of occupancy soon.